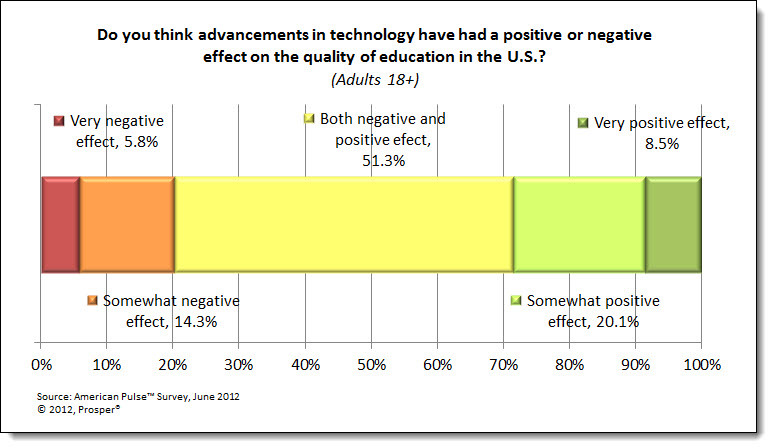 It seems as though Americans were right in saying the quality of education in the U.S. is slipping, and recent American Pulse results support that argument. 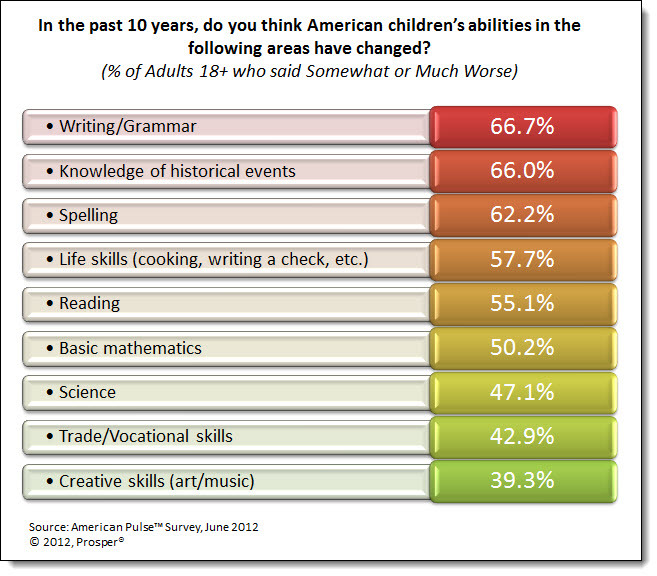 66.0% said our children’s knowledge of historical events has gotten somewhat or much worse in the past 10 years. However, it’s not just the children who are forgetting key facts about U.S. history—older generations’ minds are slipping as well, and they don’t have a “failing school system” to blame. The gold stars are few and far between for the Presidential Pop Quiz. 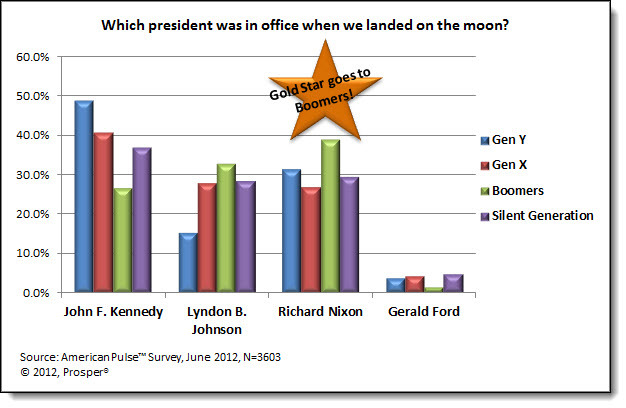 Which president was in office when we landed on the moon? Although it seems factual knowledge of the U.S. presidents is lacking, American citizens have a good idea of which presidents would do the best job handling the current economic situation. Nearly 1 in 4 (23.5%) would bring back Ronald Reagan if they could pick any past or current president to run the country. Older Americans show more support for the former-actor-turned-politician; 30.5% of Boomers and 32.4% of the Silent Generation miss Reagan’s tax cuts, deregulation efforts and ability to sustain general prosperity across the nation. Bill Clinton was the #2 pick for most (#1 for Gen Y). I think it’s safe to say Americans don’t want another scandal, but they would prefer a drop in national debt! 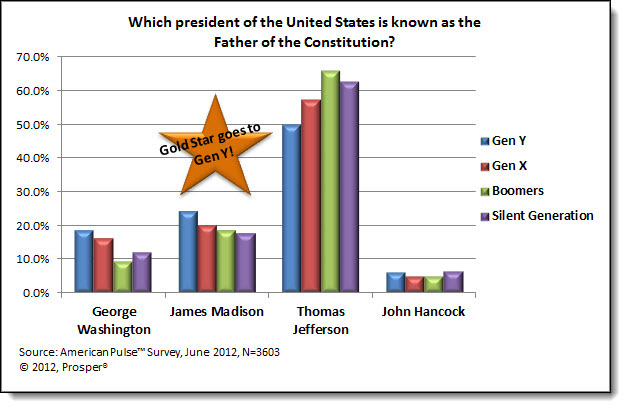 The #2 for Gen Y is current president, Barack Obama, third among the general population in presidential popularity. To see how Obama stacks up in 2012, check out the American Pulse™ InsightCenter™, updated twice a month. Confidence Cools Off As Summer Heats Up + How Does the Stockholm Syndrome Relate to Savings? This month, my co-host for the BIG Call was John Mariotti, President/CEO & Founder of the Enterprise Group. John also currently serves as a Director on several corporate boards and is an award winning author. For this month’s BIG Call, John supplemented our favorite data on confidence, employment, personal finances, and spending plans with his unique analysis and understanding of these topics. – Why are consumers seemingly holding back when it comes to paying down debt or increasing their savings? 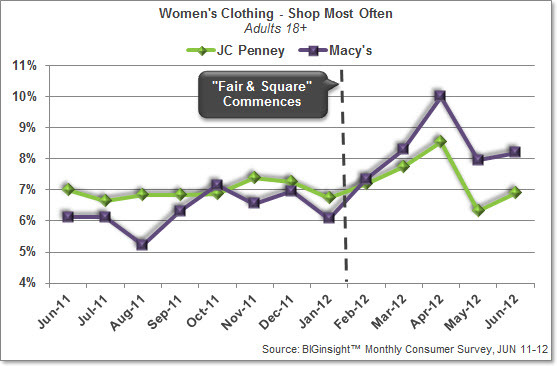 – How is JC Penney’s “Fair & Square” faring? For the full, complimentary June 2012 BIG Call slide deck, please click here. Pain at the Pump: Who (or What) is Controlling Pump Prices? In an election year, gas prices are more than just a concern for consumers. They become a hot topic in debates and fodder for those political ads we all love so much. Consumers’ pain at the pump can quickly turn into a reason for voting (or not voting) for a particular candidate. In our May American Pulse survey, we asked respondents who or what they believe controls gas prices, and the American people were most likely to indicate that most control is held overseas. Nearly half of Adults 18+ believe that leaders in the Middle East are in control, followed by 44.3% who say that good ol’ supply and demand holds the power, while “International Conflicts” come in third. Under one in four say that Congress (24.4%) or the President (23.1%) are responsible for pump prices. When breaking this down by generation, the youthful are more likely to spread the power out. While supply and demand tops their list, they are the least likely to say this basic economic principle controls gas prices. They are also the least likely to believe leaders in the Middle East are in control, but more likely than older generations to say the President and Congress are holding the reigns. 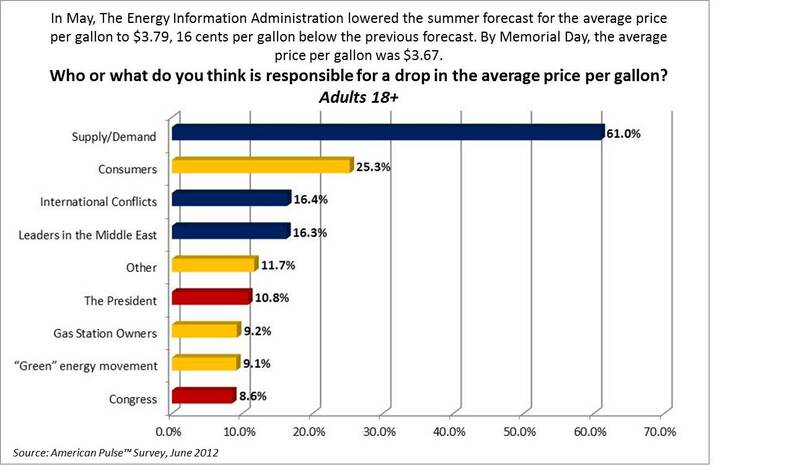 When we asked these questions in May, consumers had expected gas prices to be $3.95 per gallon by Memorial Day weekend, only to be pleasantly surprised when they were only at $3.67 per gallon (EIA.gov). With gas prices below expectations and continuing to decline (not to mention those $5/gallon summer forecasts we were hearing about heading into the Spring seemingly by the wayside), we decided to ask consumers in our June American Pulse survey who they believed was responsible for the drop in the average price per gallon, using the same list of available answers. In other words, we know who they think controls them, but who do they give credit to when things are going well? For Adults 18+, supply and demand tops the list of responsible parties when it comes to prices declining, followed by consumers themselves (the “demand” side of that S+D equation). As they did with the control, Gen Y was most likely to spread out the credit. Older generations were more likely to focus on supply and demand and consumers. 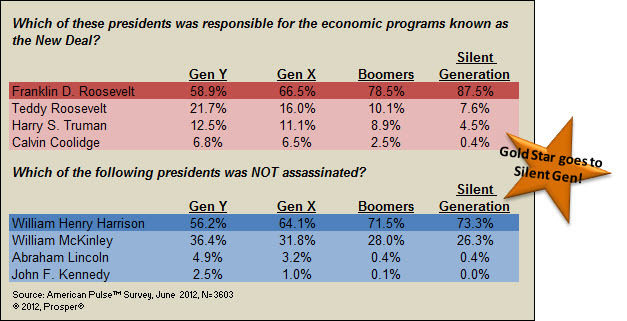 20.9% of Gen Y indicated that the President was responsible, compared to just 12.6% of Gen X, 6.2% of Boomers, and 4.5% of the Silent Generation. Congress followed the same trend with Gen Y being the most likely to indicate they were responsible for the drop in prices. So, let’s bring this all back to the election. 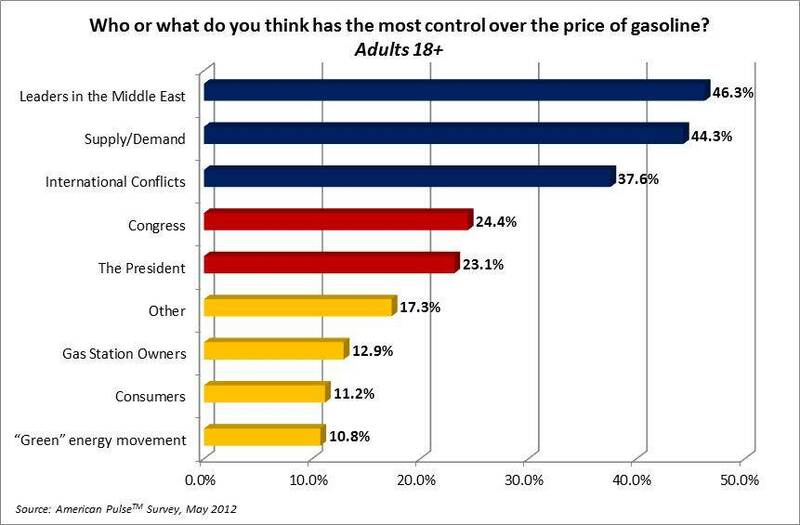 Will gas prices have a direct impact on who consumers vote for in the November? If consumers are feeling the pinch (or even anticipating it) because of the dollars draining from their wallets when they fill up their tank, it seems the faces of the incumbents in the Oval Office and at the State House will be flashing in their minds along with the dollar signs. Steep gas prices could be an advantage for those looking to steal a seat in Congress or make Pennsylvania Avenue their new address. On the flip side, with consumers not giving a whole lot of credit to politicians currently holding office, a slight drop in gasoline prices alone probably won’t be the tipping point for incumbents to hold onto their seats. 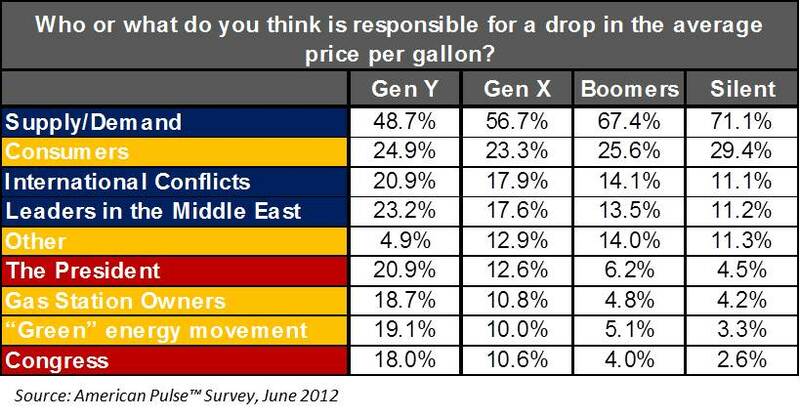 Either way, Gen Y is most likely to equate pump prices with political offices. 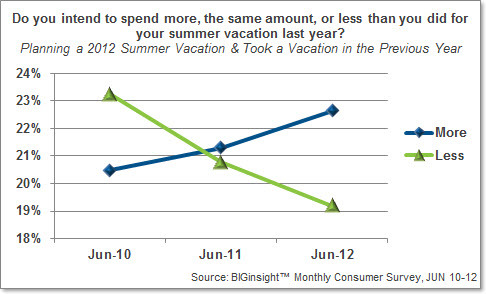 Will 2012 Mark the Return of the Great American Vacation? With nearly 30 million Americans hitting the road for the Independence Day holiday, we thought it’d be interesting to take a look at what other vacation plans consumers had in store for the summer – if any. For the past three years, we’ve been asking the nearly 9,000 respondents in our Monthly Consumer Survey whether they are taking some time off over the next few months [which I would deem necessary for my sanity] and, if so, how much they plan to spend in comparison to the previous year’s outing. So let’s pile into the Family Truckster and see where this data takes us. 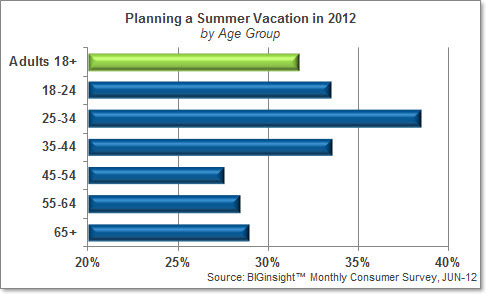 Summer vacation plans are the strongest among those under 44, presumably because those are the households most likely to be catering to children. [Hello, Walleyworld Disney World!] Nearly two in five (38.5%) of those 25 to 34 are booking summer outings, while a third of those 18 to 24 and 35 to 44 are making plans. Adults 45 to 54 are the least likely to be enjoying a little fun in the sun over the next few months; these consumers, though, might be feeling a little strapped with college tuitions, squirreling away funds for retirement, etc. As age increases beyond 54, it appears that consumers are more likely to be enjoying travel time, perhaps in retirement. Now will this year’s travelers be going on the cheap or booking five star hotels? They’ll probably fall somewhere in between, though leaning toward the more practical, budget friendly side. 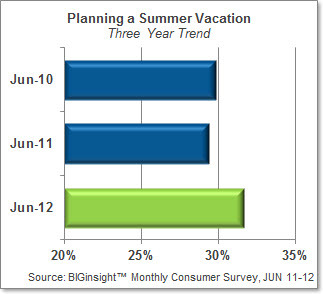 Among consumers planning to take a vacation, more than one in five (22.6%) plans to spend “more” than they did last year, while nearly as many (19.2%) will be spending “less.” This small difference might be significant, though: for the first time in recent memory (i.e. since 2010) those planning to spend “more” have outweighed those determined to spend “less.” [Last year was pretty much a tie.] The balance of vacationers (53.3%) is budgeting the “same” as previous years, so don’t expect a shortage of penthouse views. Just remember, wherever your travels take you this summer – or at any point in the future – always avoid Cousin Eddie’s and never let the dog near the picnic basket. June Insights – Hot Off the Press! Early each month, we release our Executive Briefing – complimentary topline insights from our latest Monthly Consumer Survey of more than 8,000 consumers. – As the summer weather heats up, confidence in the economy cools off. This month, just 31.3% feels very confident/confident in chances for a strong economy, down from last month and marking the second consecutive month of decline for this indicator. – Good luck, Class of 2012: With the official U.S. unemployment remaining a discouraging 8.2%, an increasing number of consumers foresee a rise in layoffs over the next six months compared to May. – May’s dip in practicality appears to have been just a “blip” on consumers’ spending radar. Additionally, practicality remains elevated from the June readings we recorded during the recession, suggesting that fault lines in the macro-economy are still rattling spending plans on a micro level. – Pain at the Pump: No gas price “fireworks” expected to set off for upcoming the holiday. Drivers are anticipating an average pump price of $3.75/gal by the end of June, 20 cents lower than their prediction for the close of May. 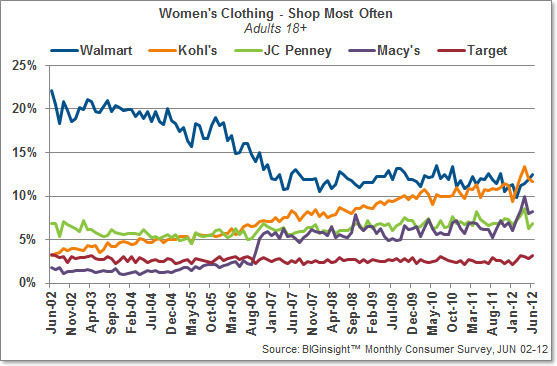 – Walmart wins in Women’s Clothing, while JC Penney is slipping. – Consumer Migration: While Walmart’s travails are well-documented in Women’s Clothing, does the big discounter’s outlook look any brighter over in Men’s section? – 90 Day Outlook is looking UPward compared to the past two years. However, with spending for the majority of merchandise categories weakening compared to May, look for practical consumers to continue to exercise caution when spending. To sign up to receive the monthly BIGinsight™ Executive Briefing, please click here. And, to view the latest BIG Executive Briefing in its entirely: June 2012. When we first took a look at the new JC Penney “Fair & Square” strategy back in March, the initial read was so-so from the consumer standpoint. 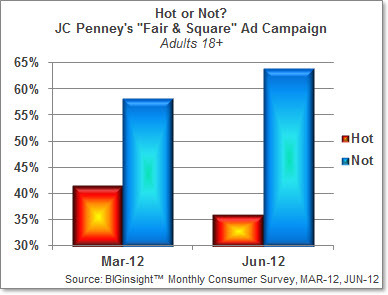 In our monthly “Hot or Not?” feature, more deemed it “not” (58.3%) than “hot” (41.7%), though JC Penney Women’s Clothing Shoppers* seemed the most willing to give the strategy a chance, particularly compared to Kohl’s, Target, and Walmart shoppers.